You stay at a place near to Udupi? 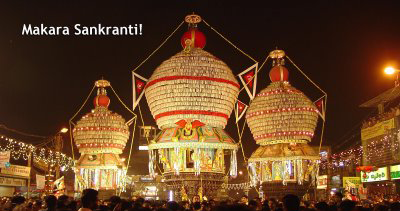 Then I am 100% sure, you will not miss the celebrations during Makara Sankranthi @ Krishna Mutt, Udupi. One of the days where almost all the people of udupi, gather around the car street ( place around the Krishna Temple, Udupi ) to have a glimpse of the Almighty Krishna being seated on the chariot with Hanuman on top of the chariot protecting him. Its such a great scen to witness when 3 chariots together will be pulled by thousands of devotees who wait for years to be a part of this grand celebration. Its a BIG FESTIVAL for people around Udupi. The car street will be gleaming with all kinds of lights, with people from different religion gathering together to witness the great celebration. The 3 chariot, Lord Chandramouli on the smallest, Lord Anantheshwara and Lord Mukhyaprana(hanuman) on the medium one and Shree Krishna on the biggest also known as Bramha Rath where in Lord Bramha will be riding the chariot. The sound of CHANDE ( a percussion instrument usually famous in Kerala), the sound of bands, tala’s, chants by the purohits, more than all of this the prayers by thousands of devotees chanting GOVINDA GOVINDA is really worth watching. The paryaya pontiff of Shree Shiroor Mutt are so actively involved in the celebrations that, they themselves come over to pull the chariot along with thousands of devotees. Just the above picture will speak much more than what I have described in the above paragraph. January 14th is day every year. So next year you are planning a religious tour to Udupi, make it a point you be a part of this sumptuous celebration and get the divine blessings of Lord Krishna.